Moisture and a soil temperature around 15oC has promoted excellent growth, lifting APC over 2600kgDM/ha. These conditions combined with the N application on the winter crops last week, has also promoted good visual crop growth (though this has not been measured). Production per cow has lifted slightly and there may be an opportunity to remove surplus pasture for conservation (baleage) if current growth rates continue. Thanks for the opportunity to meet so many stakeholders at the Waimumu Fielddays last week; it was very successful with lots of contacts and interest. Many thanks to DairyNZ for hosting the Hub on their site and assisting with Hub enquiries. Special thanks also to Dr Dawn Dalley from DairyNZ who was available to discuss Hub research and ‘future plan’ questions. 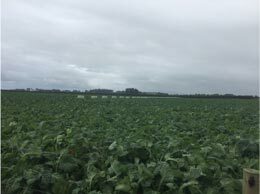 Looking at applying a fungicide spray to half of the Hub fodder beet after warm, wet conditions make ideal conditions for fungus problems. Two sprays, 30 days apart are required for best results. This combined with a 42-day grazing with-hold has prompted the decision to only treat half the crops. This provides the flexibility to graze some of the fodder beet in late lactation if DM yields allow. Four herds split evenly on age, BW / PW and on the winter crop trial treatment groups to ensure the herds are as even as possible. Each herd allocated a farmlet corresponding to their herd tag colour Green, Blue, Yellow and Pink. Farmlets have paddocks allocated so each herd has equal walking distance from the shed and the same proportion of each soil type and equal proportions of pastures in the FVI trial (forage value trial – refer web site section on research). Staph Aureus has been identified in approximately 40 cows at The Hub. A high bulk SCC and cows not reacting quickly to treatment encouraged investigation leading to this diagnosis. Infected cows have drafted out and are being milked last to prevent the spread of this infection. The four herds are to remain on their allocated farmlets at all times. The 2017/18 season aim is to feed all cows in a similar manner all season. Any differences to be recorded. Decision rules for Cows of BCS 4 or less are that they can be fed extra supplement in the shed as required by the farm team and be milked OAD but will remain in their allocated herds for research purposes. The concentrate in the shed is a 50:50 mix of PKE and barley. R1 heifers are behind a wire rotating around the platform, no supplements offered. R2 heifers on the support block are also being rotationally grazed with no supplement offered. At these rates of PKE we are still recording a FEI target of A. Total area is 327ha(eff), 32.5ha(eff) young stock block and 294ha(eff) platform. Winter crop is grown on both blocks for all stock. Crop rotation is two years in crop then re-grass. PGG Wrightson grass cultivars used are Rely, Platform and Excess, all diploids. Where target residuals are missed, topping after grazing is the tool the farm team use as needed. 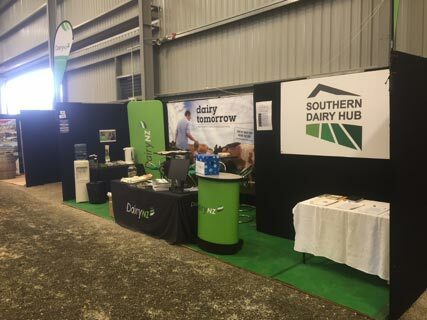 Thanks to those that called in to see us last week at the Fielddays! 6 week in calf rate confirmed at 79% of cows scanned. More info with a breakdown to come. Advertising and interviews continue for another permanent employee to lift our team to 5 permanent farm staff for the rest of this season and into the next.